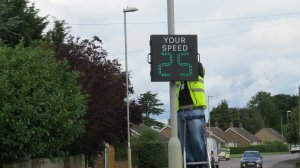 Residents will, hopefully, have noticed two new signs that have appeared in the Village which display vehicle speeds. The purchase of these two signs are the result of a successful Local Highway Initiative bid that the Parish Council made at the end of 2016. The County Council have agreed to pay 50% of the cost of these signs and it is hoped that they will go a long way to helping eradicate the problem of speeding drivers along our village roads. The signs are "intelligent" devices insofar as they log all data in respect of number of vehicles, times of the day (or night), speed etc etc. The information can then be used to build up a pattern which can be used as evidence for any future traffic calming works that are desired. 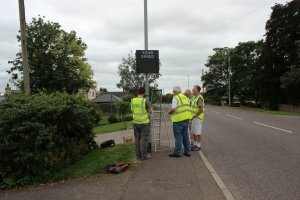 The signs are movable and the Speedwatch Team will be moving them to different locations throughout the village on a regular basis to build up a picture of those areas where further works may be required. 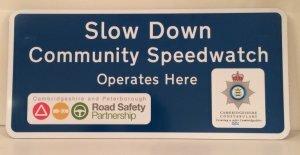 The scheme is run by the Cambridgeshire Police Force and is supported by Cambridgeshire and Peterborough Road Safety Partnership. It is not about enforcement...that is still the job of the Police. It is about educating motorists in the law in relation to speeding, plus monitoring any trends in speeding in neighbourhoods. Volunteers do not use handheld devices nor do they photograph vehicles. All volunteers are highly visible at the roadside in their hi-viz wear and only operate in areas approved by the Police. There is no hiding vehicles around bends, or behind bushes. The team are not out to trap as many drivers as possible, the mere presence of the team, which will be a minimum of 3 people, will have an immediate effect on the behaviour of drivers, and teams have reported notable changes in driver attitude to speed limits where they operate. Most drivers will understand the objectives of the scheme is to slow drivers to, or below the posted speed limit, and for those that don't respond accordingly, the registered owner of any vehicle seen exceeding the speed limit is sent an advisory letter by the Police explaining that speeding is unacceptable to the local community. Any driver who accumulates more than two warnings will have a personal visit by a Police officer. If you are over 18, why not get actively involved in monitoring the speed of vehicles travelling through your neighbourhood, and encourage safe driving. How much of your time is required? Give as much or as little time as you are able. Working during daylight hours and only in 20, 30 and 40mph areas. Alan will train volunteers to work in teams of three, around the Village for periods of one hour.